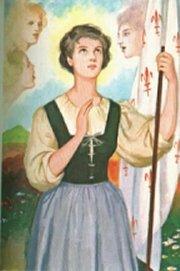 Even though Chiquita dressed as Mother Teresa for our Parish Party, she had been planning on dressing as St. Joan of Arc on All Hallows' Eve. Originally I thought she would just wear one of the boys' knight costumes, but that was not exactly what she had in mind. She wanted to dress as "The Maid of Lorraine" looking more like the picture in our Picture Book of Saints. We actually didn't even put together her costume until an hour or so before the party, but we were both very pleased with how it turned out! She wore a simple white shirt, the breastplate that my brothers used when we were younger, and one of my gray knit knee-length fold-over skirts, pinned to fit her tiny little waist. 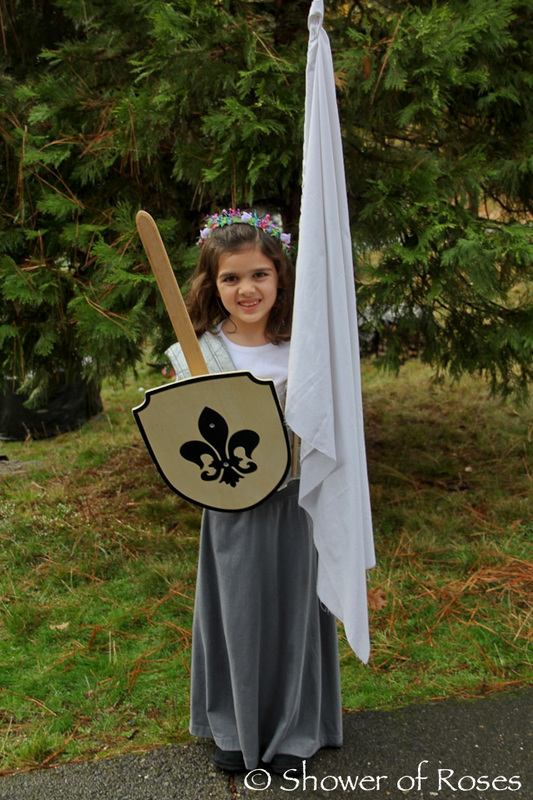 The white flag was simply a piece of an old sheet pinned to a wooden dowel, and she pulled out our Fleur-di-lis Sword & Shield Set made by Schylling. We finished her costume with a ring of flowers similar to this one (thanks for the suggestion, Charlotte!) and that was it! O Lord, You raised up in a wondrous manner St. Joan, Your Virgin, to defend the Faith and her country. Grant that through her prayers Your Church may enjoy lasting peace. This is WONDERFUL!!! I showed my daughter, who is also 7 and loves Joan of Arc and she was all smiles and LOVED the pictures of Chiquita!!! I love Saint Joan and Chiquita looked so sweet! The flowers in her hair are so pretty - a perfect finishing touch to the costume! 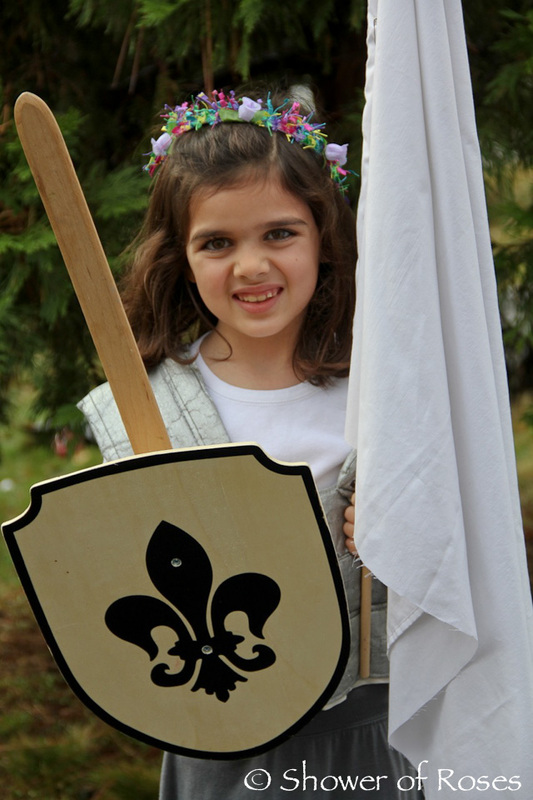 My 7 yr old was going to be Joan of Arc as well, but decided to be Saint Kateri because of her recent canonization. That skirt looks really comfortable - where did you get it? I'm always on the lookout for comfy, long skirts! Hi, I don't know if you are aware, but your photo has been used on a different website as part of an article about female role model costumes. I know because a photo from my blog was used in the same post. The author of the post (http://www.rewards4mom.com/adorable-little-girls-dress-up-as-badass-female-role-models/) has a link to our respective posts within the title of each costume, but there is no photo credit, and I know that I was never contacted to ask permission to use my photo. I have contacted the website on twitter expressing my frustration @RewardsForMom, so I don't know if the post will be removed or just my photo/costume segment. I thought I'd inform the other bloggers whose content/photos were used.